Ghostbusters 3 Follows a New Group of Ghost-Hunting Teens? We have some new details on Ghostbusters 3. It was recently revealed that Jason Reitman, son of original Ghostbusters director Ivan Reitman, has been working on a sequel to the original movies in secret. Even though the movie is expected to begin production within the next few months, few details were actually revealed in the initial announcement. But we now have word that the sequel will be bringing a group of four teenagers to do some ghost busting. According to multiple reports, Ghostbusters 3 will feature a group of four main characters, all teenagers, two of them boys and two of them girls. One of the reports notes that one of the characters will be a 12-year-old girl that has a knack for science who has difficulties "interpreting and expressing emotions and speaks with a flat delivery that make her observations humorous." Another one of the characters is said to be a 13-year-old boy who has a fondness for conspiracy theories, an intense excitement for the unknown and actually narrates real life. THR Reporter Borys Kit also corroborated these reports on Twitter. "The main characters will be 4 teens: 2 boys, 2 girls, per sources." One of the reports also has a little bit of potential plot info, claiming that the movie will center on a family who moves back home to a small town, where they begin to discover more about who they are and the secrets of the town. As for the new characters we're set to follow? 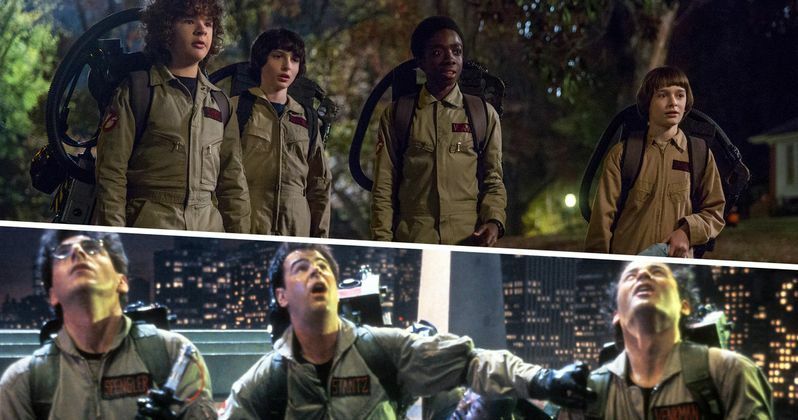 Whether or not these character descriptions wind up holding true, it does sound like Ghostbusters 3 is going to go the Stranger Things route by having us follow a young group of individuals. None of the reports make any mention of who might be up for any of these roles, nor have they made any indication as to whether or not any of the original stars are going to return. However, both Dan Aykroyd and Ernie Hudson responded to the initial news on Twitter and it seems likely they would show up in some capacity. Bill Murray would be the big question mark. It's also worth pointing out that the two character descriptions provided make the boy sound a bit like Ray and the girl sound like Egon. Could it be that these are the grandkids of the original team of Ghostbusters? That's purely speculative, but if they are going to go the younger route, it would make sense for these new characters to be connected to the original team somehow. If that is indeed the case, are they going to be aware that Ghostbusting is in their blood? Or will it be an old family secret by that point? Currently, we have more questions than answers, but with a summer 2020 release date already locked in by Sony, we should be learning more firm details in the near future. Jason Reitman is directing and co-writing the screenplay with Gil Kenan. We'll be sure to bring you more details on Ghostbusters 3 as the information is made available. This was previously reported by Birth.Movies.Death.